I'm thrilled to share that I'm partnering with Savers for this post featuring some Halloween decor DIYs. For those of you who are unfamiliar with them, Savers is an epic thrift store family that includes Savers, Value Village, Village des Valeurs and Unique Thrift, boasting over 330 locations throughout the US, Canada and Australia. At Savers, discover one-of-a-kind costume and decor finds at prices that won’t break the bank. I'll admit that I didn't have any particular DIY project in mind that I wanted to create for this post. I decided I'd browse through a few of my local Savers stores and hopefully inspiration would strike! I’ve had a lot of luck in the housewares department over the years so that was the first section I went to. 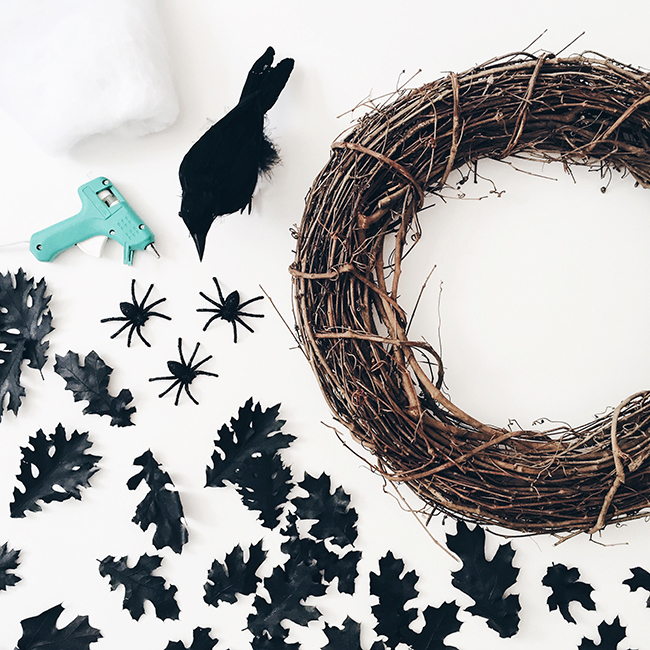 When I came across the grapevine wreaths, I knew I could come up with a few different themes… a rustic/pumpkin patch one, maybe one with some bats, and of course, one with spiders. In my mind I could see it all coming together! I then searched through the craft supplies and Halloween decor to pick up a few essentials. Each of these wreaths are so easy to create! Hang them on your front door or in a cozy spot in your home to add a little Halloween flair. Below are step-by-step instructions to create your own. For more Halloween DIYs, check out my Pinterest board with Savers, and feel free to share your favorite, thrifty Halloween DIY projects on social using the hashtag #thriftortreat! begin by snipping the stems off the leaves, and start to arrange them on the wreath. cut the jute ribbon into 6" strips and fold them in half. i though the jute ribbon would add another nice fall texture! once you decide how you want everything to be laid out (i decided to go with 3 leaves with a piece of jute ribbon on top), start gluing everything down! after all the leaves and ribbon have been glued to the wreath, it's time to add the pumpkins. i decided to use 3, but feel free to use as many as you want! i glued mine around the center of the leaves. i used 2 different-sized bat stencils to trace and cut out bats from the felt. i cut out a dozen bats in all and began to place them on the wreath. move them around until you come up with an arrangement you're happy with! when you've settled on an arrangement, it's time to start gluing! secure each bat in place and you're done. if you're lucky enough to come across faux black leaves–use them! if not, you can spray paint them black like i did (it's a little time consuming... ~15 minutes to dry each side). once the leaves are dry, it's time to start gluing them to the wreath! cover about 2/3 of the wreath with the leaves. for the remaining bare section of the wreath, take the stretchable spider web and start to wrap it around the wreath. i found that breaking off small sections of the web, stretching it out, and then wrapping it around the wreath works best. lastly, let's add our spooky little friends to the wreath! i glued 3 spiders on top of the web, and nestled a raven into the leaves. disclosure: i've partnered with Savers on this post to share some festive Halloween DIYs. as always, all thoughts and opinions expressed here are my own.